Bobby Baldwin, professional poker player and influential businessman, was inducted into the Poker Hall of Fame in 2003. He is especially famous for his impeccable poker skills which landed him a total of four WSOP bracelets over the course of his career. Baldwin currently resides in Las Vegas, Nevada and is the President and CEO of the MGM/ Mirage Resorts. He is highly respected in the gambling community, having found a lot of success in the industry. Bobby Baldwin was born in 1950 in Tulsa Oklahoma to an upper-middle class family. At only twelve years of age, Bobby Baldwin played in his first poker game, and despite losing he was immediately hooked. He played casually throughout high-school and was known as the person to beat among his peers. Baldwin attended Oklahoma State University during the late sixties and early seventies, and it was there that his fascination with poker really took off. In 1970, Baldwin and a few of his gambling buddies took their $5,000 that they earned while playing poker on campus and headed to Las Vegas. It was only a few hours after their arrival that their entire bankroll had been diminished. For most people this would be the end of the story, but not for Baldwin. He begged the casino for a $500 credit, which they eventually gave to him. With just a few chips left from losing all of that as well, Baldwin turned the game around and continued on a winning streak earning him nearly $180,000. Having this new increased budget to work with, Baldwin spent the majority of his college career investing his time and money into sports betting. He was especially interested in the NFL, but he dabbled in other areas as well. Shortly after college, Baldwin married his high-school sweetheart, but unfortunately their marriage didn't last as they were divorced just one year later. 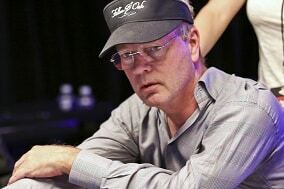 Baldwin's poker career took off in 1977 when he won his first and second WSOP bracelets within that same year. He won a WSOP bracelet at both the Deuce to Seven Draw and the Seven-Card Stud tournaments for a total of $124,000 in proceeds that year. During 1977 to 1979, Bobby Baldwin won WSOP bracelets three consecutive years in a row, which has only been accomplished by a few people over the course of WSOP history. When Baldwin won the No Limit Holdem World Championship in 1978, he became known as the youngest winner in history to do so being just twenty-eight years old. However, several people have since broken his record. Instead of becoming a professional poker player, Baldwin strived towards a different goal, being particularly interested in the management end of the gambling business. In 1982, Baldwin became a consultant for the Golden Nugget casino and just two short years later he became the President of the company. Continuing to work his way up the corporate ladder, Baldwin also became president of the Bellagio hotel and casino in 1998. At the turn of the century, upon the merger of Mirage Resorts and MGM Grand, Baldwin became the President and Chief Executive Officer (CEO) of Steve Wynn's Mandalay Resort group which came with an astonishing seven million dollar contract. Five years later, Baldwin became the CEO and President of the announced Project City Center while still attending to his responsibilities at the MGM/Mirage resorts. Baldwin has since been behind the development of several other successful subsidiary resorts as well. In 2007, the Bellagio Casino opened "Bobby's room," which is a signature high stakes only poker room established in Baldwin's honor. There's a $20,000 minimum buy in for this room. Along with Baldwin's poker achievements, he is also a thriving world class billiards player and an avid off road racer. Baldwin came out with "Bobby Baldwin's Winning Poker Secrets," in 1979. Years later in 2004, Mike Caro and Baldwin worked together to revise the book, making it a huge success among the poker community. Players of all different levels bought the book and were inspired from Baldwin's tips and strategies. Bobby Baldwin recently got remarried on August 2nd, 2012 to Audra Hendley at their home in Southern Highland where they presently reside today.